HHB has introduced the FlashMic DRM85-C Cardioid Microphone, an innovative mic that combines a Sennheiser capsule with a broadcast-quality Flash recorder. 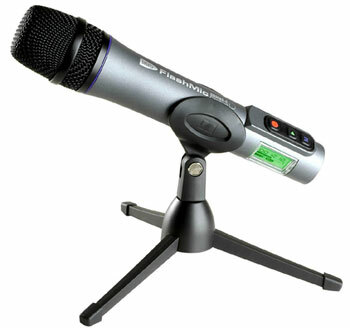 The mic is designed to be a portable recording solution for broadcasters and podcasters. The mic joins HHB’s original, omni-directional FlashMic DRM85. Both FlashMic models share the same feature set, which includes 1GB Flash memory for up to 18 hours recording, USB audio data transfer, a high-quality preamplifier with full manual or automatic gain control (AGC), an illuminated LCD display and nine user templates which can be configured externally using the FlashMic Manager software supplied. Unfortunately, the FlashMic’s cutting edge technology comes at a price; the DRM85 retails for about $1200. According to HHB, radio journalists cite rugged build quality, ease-of-use, fast file transfer and instant, one-button recording among the key reasons for the FlashMic‚Äôs success. Thanks for the feedback – we updated the article with the cost. How long do you think it will be until this type of Mic is going for $200?